Move the Turtle is an iPad app designed for juniors aged 6–12 to learn basic computer programming skills using an implementation of the Logo programming language. The goal of the game is to move a turtle around the screen using programming instructions. As it moves, the turtle leaves a trace that can be used to draw various shapes. It teaches basic programming concepts through a game type interface. 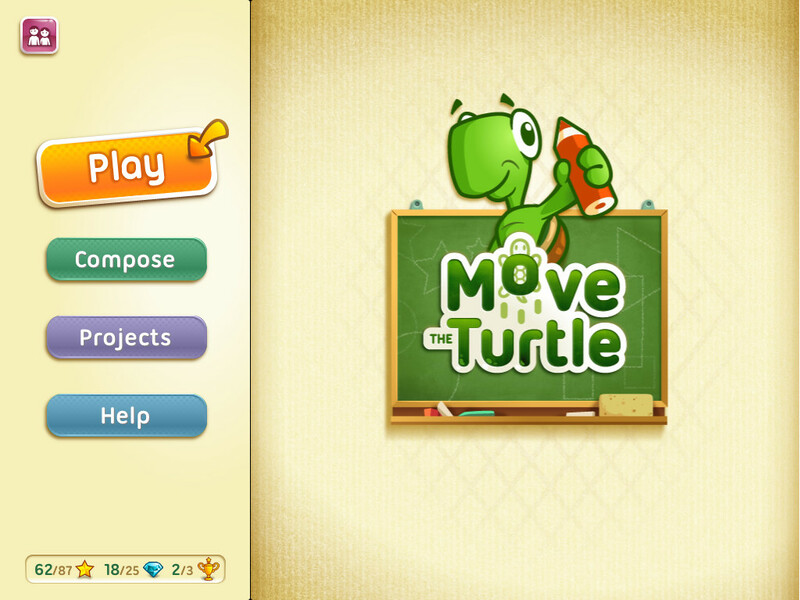 Kids can try out their programs and see them run visually on the screen as the turtle moves about. They can then edit their program to complete the given task. The turtle can be sped up or slowed down, depending on the length of the program. The game is divided into two screens: an instruction panel on the left and the actual game board on the right. The turtle is placed on the center of the board, with a blue diamond located nearby. 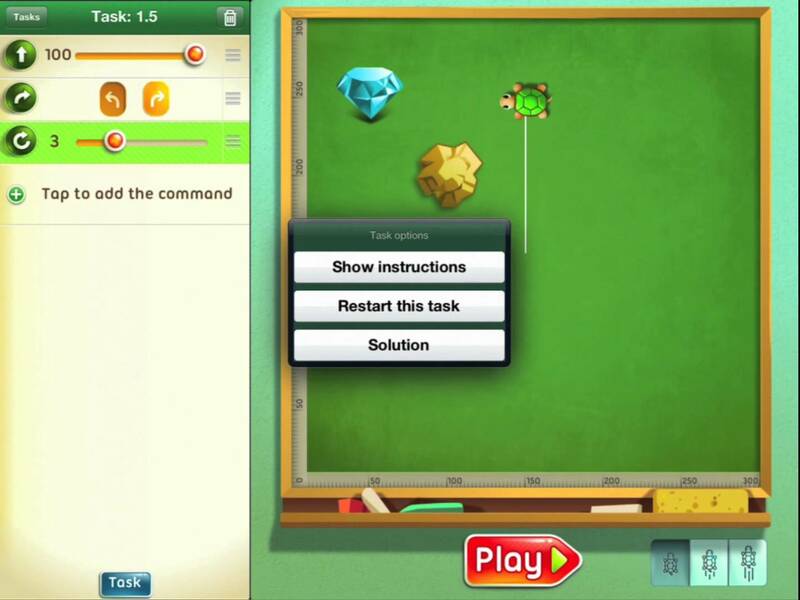 Guided by a step-by-step tutorial, kids try to move the turtle in one or more steps to hit the diamond, and complete other objectives specific to each level. To move the turtle, kids add one or more instructions on the left panel. The instructions are fairly simple, and does not require them to actually write codes. These commands, such as move, turn, set color, and play a sound, can be customized. For example, kids can set the turtle to move north 150 steps. Kids can reorder the instructions to decide how they are going to be executed. It is also very easy to remove lines they don’t want. The app will start introducing tweaks into these basic commands in the second chapter, where they can fine-tune and control how the program works. It will provide hints and ask kids if they want to start over. Kids can also hop back and forth between completed lessons if they want to review or gain further mastery in a skill. 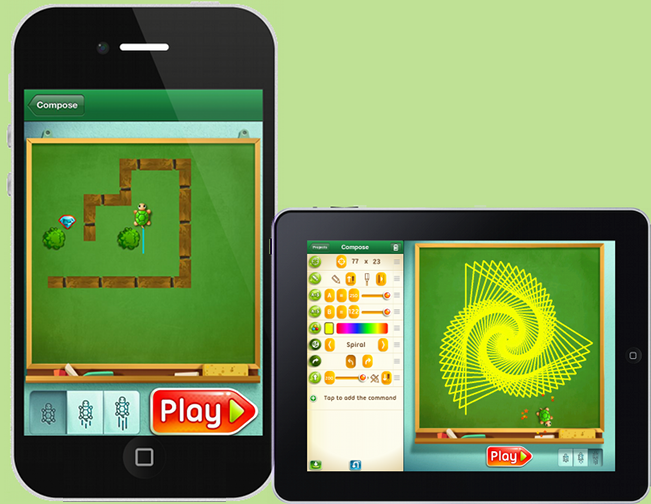 Move the Turtle is one of the few apps that does a good job helping kids learn some coding basics. The Compose section allows you to create your own programs from scratch, without completing any particular task. You have access to all of the syntax that you learned in Play. You can also save procedures here, for use later. Under Projects, there is a list of more than a dozen pre-written programs that you can include in your library, or just play with and learn how they work. This is a great place to spend time to learn things that you didn’t practice in the Play section. My Library contains all of the procedures that you have saved, and any of the built-in examples that you moved there.